George Frederic Watts, OM (23 February 1817 – 1 July 1904) was a popular English Victorian painter and sculptor associated with the Symbolist movement. Watts became famous in his lifetime for his allegorical works, such as Hope (see image) and Love and Life. These paintings were intended to form part of an epic symbolic cycle called the "House of Life", in which the emotions and aspirations of life would all be represented in a universal symbolic language. He enrolled as a student at the Royal Academy at the age of 18. He also began his portraiture career, receiving patronage from his close contemporary Alexander Constantine Ionides, with whom he later came to be close friends. In the 1860s, Watts' work shows the influence of Rossetti, often emphasising sensuous pleasure and rich color. Watts's association with Rossetti and the Aesthetic movement altered during the 1870s, as his work increasingly combined Classical traditions with a deliberately agitated and troubled surface, in order to suggest the dynamic energies of life and evolution, as well as the tentative and transitory qualities of life. In 1891 he bought land near Compton, south of Guildford, in Surrey and built the Watts Gallery nearby, a museum dedicated to his work. Some of Watts' late works seem to anticipate the paintings of Picasso's Blue Period. He was also admired as a portrait painter. His portraits were of the most important men and women of the day, intended to form a "House of Fame". 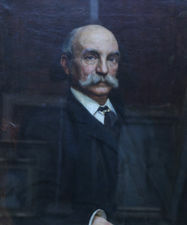 Many of these are now in the collection of the National Portrait Gallery – 17 were donated in 1895, with more than 30 more added subsequently. In his portraits Watts sought to create a tension between disciplined stability and the power of action. He was also notable for emphasising the signs of strain and wear on his sitter's faces. Sitters included Charles Dilke, Thomas Carlyle and William Morris.